Join Carolyn as she talks about how important the relationship between therapist and client is, and what factors go into making a good one. AS: Welcome to our podcast, Conversations with Carolyn. I’m here with Carolyn Spring. AS: Today we’re going to talk about the importance of the therapeutic relationship. It’s something that most people, like me, don’t really know much about. I suppose I have a few preconceptions about it but if I’m honest I don’t really understand why it’s so powerful. Can you explain? CS: It is a strange thing, isn’t it? Why sitting with someone for an hour or so every week can completely change your life. It doesn’t seem enough, does it? And you’re right that it comes with a number of preconceptions. Before I started therapy, I had no idea what it is was all about either. I guess I thought that it was a supportive chat, a bit motivational, a bit of ‘ra ra’ and maybe pointing out where you’re going wrong, giving you a bit of advice, and then you would just be ‘fixed’. To be honest, a drugs cure seemed much more attractive. Because while I thought that I was mentally ill, I guess I thought that I would need a drug to fix me. Because after all, that’s our paradigm from physical health – if you’ve got bronchitis, you might need an antibiotic. If you’ve got cancer, you might need chemotherapy. So, I didn’t really understand how I could stop being ‘mentally ill’ without drugs. AS: But then you began to reframe it as trauma, not mental illness? CS: That’s right, but still the whole therapy thing didn’t make a lot of sense to me. I suppose I thought that if I just talked about what happened to me, that I’d feel better – I guess I had absorbed some Freudian concepts about repression, and so what I needed, I thought, was catharsis, although I wouldn’t have put it in those terms. And I needed it to stop being a secret. I certainly didn’t understand about processing and metabolising traumatic material or learning to feel safe in your body again (what’s technically called neuroception). I didn’t understand that it would be about retraining the brain, or anything like that. And I didn’t see that the therapeutic relationship is central to that. AS: So, you wouldn’t agree with therapy being delivered by artificial intelligence then? CS: Ha! It’s a funny idea, isn’t it?! I think there are some aspects of the recovery journey that can be delivered electronically if you like – for example, the psychoeducational aspects. Because there’s a lot of skills that we just need explaining to us, like learning a language. But even then, it’s much more real when that comes from another human being, when it’s rooted in real life, rather than being disembodied. I think left brain stuff of facts and information is so much more ‘learnable’ when it’s delivered in the context of the right brain relationship. So, delivering psychoeducation entirely by computer has its limits. And the really fundamental work of recovering from trauma comes, I believe, from this transformative relationship with another human being. AS: How is it transformative? What’s it all about? CS: I think the simplest way of understanding it is that we have experienced a wound – what we might call relational trauma. It’s been perpetrated or caused by another human being. And so we need to have a reparative experience, an opposite experience, where instead of hurt and harm and abuse, we experience care and compassion and empathy. That then has the potential to change the way we view other people, ourselves, and the nature of the world. It’s very powerful. But it’s more than that too. It’s a lot about our brains developing and making connections through right-brain to right-brain communication, through mirror neurons, in exactly the same way that a baby’s brain grows in relation to its mother or other attachment figure. It’s not with words. It’s not cognitive or intellectual. It’s a profoundly unconscious, primitive process where we develop our sense of self – of who we are as human beings and our place in the world – through what is mirrored to us in the face and eyes and body of our attachment figure. And when that process is disrupted by trauma, or didn’t get to take place because of inconsistent, neglectful or even abusive parenting, then we can kickstart it again instead in the therapeutic relationship. There are all sorts of things that we don’t yet fully understand, that we don’t have the words or concepts to describe, that change patterns of neural firing in our brain, when we, for example, experience empathy, when someone is with us when we experience big emotions and they help us to feel them and then to soothe them. You have to read a lot of very complex brain science stuff by people like Allan Schore to really understand it, but even if we don’t understand it, it still works. It’s very profound. We are healed in and through our relationships. That hour or so a week with a therapist can literally rewire our brains – even if we don’t understand any brain science or what’s going on. AS: Okay – but how do you build that relationship in the first place? How do you know if the therapist you’re working with is going to be any good? CS: That’s a good question and there’s no simple answer to that. In our current system we value qualifications, and rightly so, although I’d say that they’re only part of the picture. But they’re a good, objective measure of people having at least received some training, which is a better foundation than none at all. Of course, it doesn’t say that they’ve really absorbed that training or that they’re suited to this work at all. I know some training courses are very thorough and responsible and put trainee therapists really through their paces before qualifying them, and that’s a very good thing. But equally there are other training courses which are more interested in pass rates and reputation and don’t even require therapists to undergo their own therapy. AS: Why is having your own therapy important? CS: Even if you don’t have any ‘stuff’ of your own to work through – which I think is very rare – then I still think it’s an invaluable experience to be the client. It helps you see it from their perspective. You go through the whole gamut of feelings that goes with being vulnerable, of not knowing the rules, of sitting with a supposed ‘expert’ and negotiating the power differential, of digging into your deepest thoughts and beliefs and feelings and doing that in the presence of another person. So, you experience attunement and you experience misattunement, and you figure out hopefully how to work that through. I think that it must be impossible for therapists who haven’t had their own therapy to understand what the process is like for a client. And that’s without resolving any of their own stuff, like attachment patterns or previous trauma, or digging into their motivations and their use of power and so on, which is so important for them to do in their own therapy before being let loose on vulnerable clients. AS: So, if a therapist has had their own therapy as part of their training, and they’ve had a good training experience and as you say been ‘put through their paces’, then does that guarantee that they’ll be effective and a good person to work with? CS: It increases the chances, and that’s a good thing, but I don’t think we should put blind faith in qualifications, especially for something as right-brain as therapy. So much of being a good therapist is about being a good human being, and how do you measure that in an exam or an essay? It’s about being very very self-aware, and being able to care deeply but without getting enmeshed or over-involved. It’s about being boundaried and having a good grasp of the theory but being able to apply that in a very reflective, thought-through way to each individual, in each individual session, and on a moment-by-moment basis. It’s about empathy and reflection and attunement and insight. It’s extremely skilled work, and experience has a lot to do with it because it’s more an art than a science. I’ve always said, it’s not so much about how much you know as a therapist, but who you are. And that’s not easily measured in a qualification. We have a system of qualifying and accrediting therapists which is the best we have come up with so far, and it is heavily biased towards theory and the academic side of it. And many, many therapists I know are really good at what they do, but they do it largely on instinct, and they hate writing essays. Many therapists get into this work later in life, having maybe struggled with the academic side of things at school, and they’re made to feel very inadequate because they don’t understand about Harvard referencing and they find reading textbooks a real struggle. And that saddens me, because the reason textbooks are so difficult to understand is a problem with the person who wrote them, not the person who’s trying to read them. It’s a problem with power in academia, the way that we write in an incomprehensible style often, I think, in order to prove how clever we are, rather than because we passionately want to disseminate our ideas. Textbooks really shouldn’t be so hard to understand! If you really grasp what you’re talking about, you should be able to explain it simply, without resorting to untranslated jargon. By all means use the scientific or theoretical terms, but at least explain them! And so it’s non-academic therapists who end up feeling inadequate. And I hate that. That’s why my training is always focused on making the complex simple, to build up and to encourage therapists, rather than making them feel stupid. Because so many of them have the key attributes and core values to make them excellent therapists – they have the reflective capacity, the empathy, the intrinsic understanding of boundaries and a really solid grasp of the theory, but they struggle to write essays about it, that’s all. AS: Okay, so are you saying that qualifications don’t matter, then? CS: No, I think they’re important, and in looking for a therapist, that should be your starting-point, that they’re appropriately qualified. All I’m saying is that don’t let that be the be-all and end-all. They’ve got to have the other qualities too – deep compassion, the ability to accurately read emotions, to manage emotions – both their own and the client’s – to be sensitive and attuned. It’s a lot about emotional intelligence not just academic intelligence. Therapy is very much a right-brain activity, and yet the qualifications for it obviously are based on left-brain dynamics. We need both. AS: What are important qualities to look for in the therapeutic relationship? CS: I think what can be confusing is that often what we want, as clients, in the therapeutic relationship, is not always what we need. If we’re what in the attachment literature is called insecure-avoidant, then we might want to come for more or less an intellectual discussion each week – keep it cognitive, keep it cool, keep it distant. Low emotion. Whereas in that situation, what we really need is to break down those defences and to engage with warmth and authenticity at a deeply connecting level, with our raw, connecting humanity. That’s what ends up being transformative – to be able to be vulnerable and to be ourselves, with all our messy insecurities and emotions, and to do that in the presence of another human being, without being rejected. Because that’s what we’re defending against by being insecure-avoidant: it’s the fear that if we show our feelings, we’ll be hurt or rejected or humiliated or worse. And then if we’re what in attachment terms is called insecure-ambivalent, then what we want more than anything is for the therapist to love us, to notice us, to care for us, to look after us, to be there for us. And we’re looking, even unconsciously, for a magical experience of connection which on its own will change us, we hope, by making us feel properly loved. Whereas what we need is someone who will hold their boundaries, someone who will encourage us to do the work ourselves – someone who will engage with us and empathise with us, but will also maintain a bit of professional distance, as it were, and encourage us to do the work of managing our feelings, of respecting boundaries, of not expecting a miracle cure, but actually to do the work for ourselves. It’s about learning to manage our feelings for ourselves, rather than always looking for others to do it for us. It’s about learning to step back from our often overwhelming emotions and mentalise and reflect and learn to tolerate distress without acting out. It’s lots of things, obviously, but what we want – the therapist to look after us and calm us down when we’re upset – is not necessarily what we need. We need the experience of co-regulation, of the therapist helping us manage our feelings, in order to develop self-regulation, of being able to do it for ourselves. But we do need to learn to do it for ourselves, rather than just waiting for our next therapy session and dumping all our distress there. So what we want and what we need are often in conflict. And that’s a difficult balance for the therapist to manage in us. As I say, that’s very skilled work. And a lot of the therapeutic relationship revolves then around these unconscious beliefs and values that we have developed in early childhood, and how they play out now. We probably won’t be aware of them at all when we enter therapy, and a lot of the work is actually to bring them into consciousness so that we can become aware of what we’re expecting in relationships, what we believe about other people and ourselves, and then to make active choices about how to behave rather than being driven by unconscious beliefs and desires. That’s of course a very psychodynamic way of looking at therapy, and there are other emphases from other schools of thought as well, but whether we focus on it or not, that’s a large part of what goes in the therapeutic relationship. AS: How do you mean, in practice? What does that look like in a session? CS: I mean that we come with unmet needs – of course we do, everyone does. And if we’re insecure-ambivalent it’s like we dump those on the therapist. We expect him or her to be perfectly attuned all the time, to ‘get’ us, to profoundly relate to and empathise with and understand us. And, of course, the therapist is human so it doesn’t always happen. They don’t get it right all the time. And we talk about the deeply painful things in our life, and they don’t make it better, and it’s frustrating and even infuriating. And so we reason that this therapist is rubbish and therapy isn’t doing any good, and we quit. But actually, this is all grist for the mill in therapy. What sense are we making of the therapist holding their boundaries and not responding to our emails or texts between sessions? Do we think they’re being mean? Do we think they just don’t care? Is that really true? Or do we believe that to be true, based on our experience of other people, especially from our early life? AS: So, our experience of people especially in childhood sets up a template for how we assume people will be in later life? CS: Yes, and mostly we’re not conscious of that. Mostly we don’t realise that we assume that the therapist doesn’t care because our mother didn’t care. And that can sound like psychobabble to a lot of people, but it’s also profoundly true. It’s what drives a lot of our behaviours. Or we might believe that the therapist is the best thing since sliced bread. They become our hero, and we start to fantasise about them becoming our best friend. That’s very normal and happens all the time. Because here, for the first time, is someone who is there for us. Each week, we turn up, and we have their full attention. And that is a powerful experience – it can be quite intoxicating. 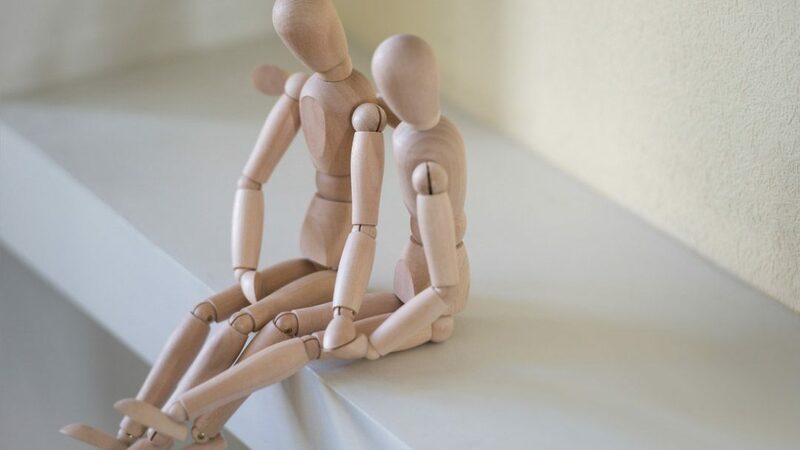 Even for people in committed romantic relationships, it’s not that common to have someone who will focus on you, listen to you deeply, and prioritise you for a whole hour. Normally in relationships it’s much more give and take than that, and for many of us who have fallen into patterns of people-pleasing behaviour, it can be all take – we only feel we’re of any value when we’re martyring ourselves and we give out to people. So, it can be very rare that someone is actually there for us. And that provokes deep feelings for us. AS: I can see that that would be a very powerful and moving experience. CS: It is. And it’s deeply uncomfortable as well. It’s like it can open Pandora’s box and all your unmet needs from all your life previously then come pouring out. Because you’ve maybe got used to the fact that nobody in the rest of your life is all that interested in you. You know, you start telling someone, maybe your partner or best friend, what’s going on for you and how you’re feeling, and they turn it on themselves and start talking about themselves. Or after ten minutes you can see that they’re getting bored. Or it unconsciously triggers their stuff and they don’t want to hear it, so they go off to the loo and they never come back. That’s a very normal experience. In society we have a real dearth of deep, listening experiences. Most people want to talk to – or talk at – people, rather than listen to them. AS: So just the simple act of listening and really focusing on someone can be quite unusual? CS: More than unusual, it affects you profoundly, especially when it happens week after week. You go to therapy, and maybe for the first time in your life here is a space where you matter. Here is a space where you can talk about yourself without feeling guilty. You can talk about how you feel and what you think without being judged or without someone else taking over and talking about themselves. It’s an opportunity, for the first time, to really figure out what you think and feel. It’s the kind of space that often doesn’t occur anywhere else in life. AS: Was that a very powerful thing for you in therapy? CS: Very much so. It was like during therapy I began to discover where my edges were. I’d had no sense previously really of who I actually was as a person. Obviously, dissociative identity disorder (DID) is an extreme representation of that. And so, it was important for all my parts to present in therapy and to have that opportunity and that space too. But as a whole, it was transformative for me to be able to stop for long enough, in a non-judgmental setting, with someone who was really drawing me out and encouraging me in this stuff, to figure out who I was and what I really thought and wanted. It took me a long time to learn how to do that – you don’t realise how automatically you censor what you say, because you’re trying to say the right thing. You’re trying to get accepted, you’re trying to be acceptable. So you adjust everything that you say to what you think you’re supposed to say. AS: But if the therapist already accepts you, then you don’t need to do that? CS: Yes, it’s a real experience of grace – of already being acceptable. You don’t need to work for it, or earn it, or anything. You just are okay as you. Everything you bring – every emotion, every thought, every fear, it’s all okay. It’s a place, unique in the world really, where not only is it okay for you to bring yourself exactly as you are, but that’s actually encouraged. If anything, if you’re still playing the acceptability game, then you win in therapy by just letting it out as you are. I think some people experience that in very positive relationships, such as with husbands and wives or partners, or in very good family dynamics, but most people from an abusive background don’t and it can be a completely novel experience. I had grown up feeling totally unacceptable. I had to hide what I felt. I had to hide who I was. I had to suppress what I wanted, and what I thought and felt, and spend my whole time assessing what was acceptable. And that was a hard habit to break. AS: But therapy allowed you to begin to figure out who you are? CS: Yes, as I said, it was like I began to find my edges: this is who I am. This is what I want. This is what I’m feeling. And you then take that new way of being out into the real world. Because the therapeutic relationship is a strange kind of alternate universe. It’s not reality. It’s a nursery, a test bed. And that can be difficult for some people to understand. AS: How do you mean? CS: The therapy setting can become more real than the real world to us, and we can start expecting the same level of acceptance and understanding from everyone else. We start setting the therapist up as the standard for how other people ought to be. But that’s not realistic. Instead, we need to take the experience we have in therapy, and internalise it. So, we don’t start demanding that everyone in the real world accepts us, and shows us unconditional positive regard, in the same way that our therapist does, or at least tries to. Instead, we need to internalise that acceptance, and – crucially – use it to start accepting ourselves. That was the key thing with me figuring out who I was. It was to accept myself as I am, rather than imposing the criticalness and the unacceptability of my family of origin on myself, as I always had done. Therapy is transformative when we take the experience of it being okay to be us, and being acceptable, and being valued, being heard, and then we apply that to ourselves: when we start treating ourselves as the therapist treats us, rather than just looking for everyone else to start treating us like that. AS: So, what would you say to the people who think that therapy is very self-centered, very self-indulgent? … that you just spend the whole time talking about yourself and navel-gazing? CS: I’d say that they need to put it in perspective. We’re talking about an hour out of 168 in a week, and usually not even every single week of the year either. Are our standards of self-care really so low that we think it’s unacceptable to talk about what we’re feeling and experiencing, how we’re interacting with the world, for just one hour a week? Of course it’s not self-indulgent. The aim of therapy is transformation. It’s to become, in many ways, a better person – the best version of ourselves that we can become. Because we come to therapy with stuff that we want to sort. We want to be different. And often that’s because of our care for others – we care about the impact our stuff is having on those around us. We’re not as patient as we want to be, we’re not as loving. We have angry outbursts. We’re not coping, and we’re being a burden on those around us. We’re not parenting in the way that we dreamed we would. And so we come to therapy to try to change these habitual ways of being, the things that we’re stuck with – the things that maybe we hate about ourselves. And so yes, of course, that requires some self-focus, some introspection. Of course, that requires a bit of navel-gazing. But it’s not being self-focused for its own sake. It’s for the sake of transformation. And ultimately, I think that’s the most selfless thing that we can do. AS: Well, our time is up but as always, it’s been fascinating talking to you. CS: Thanks very much. See you next time. Really interesting….. It has made me think about my interactions in the NEW sewing class I am attending and why I might be so tearful and how the lady who runs it responds to me. I love listening to you. Thank-you. Carolyn- despite having done a lot of therapy, this is fascinating reading. The therapeutic relationship is so complex… I’ve spent so long battling with the intense feeling towards my therapists and struggling with how this unique relationship will really play out into healing and ongoing life. The point below says it all. If only there was a way of talking about what and how the therapeutic relationship brings/ works earlier on, it could be so helpful. Thank you for apparently being inside my head when you write your posts!